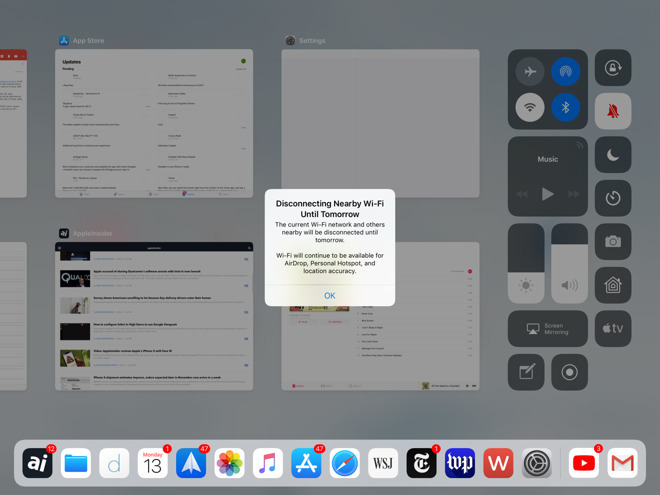 A somewhat controversial change in iOS 11 will come with a little more clarity in the forthcoming iOS 11.2 update, with the latest beta adding a prompt informing users that turning off Wi-Fi and Bluetooth via Control Center doesn't fully disable them. Apple made the switch with the launch of iOS 11 in September, ensuring that features such as AirDrop and Apple Watch connectivity remain active even if a user disables wireless connectivity. Rather than turning off the wireless functions completely, flipping the switches in Control Center simply disconnect from networks and third-party accessories. "Disconnecting Nearby Wi-Fi Until Tomorrow. The current Wi-Fi network and others nearby will be disconnected until tomorrow. Wi-Fi will continue to be available for AirDrop, Personal Hotspot, and location accuracy." "Disconnecting Bluetooth Accessories Until Tomorrow. Currently Connected accessories will be disconnected and other accessories will not connect. Bluetooth will continue to be available for Apple Watch, Apple Pencil, Personal Hotspot, and Handoff." Because iOS 11.2 remains in beta, things could change before the software is released to the public. But as of beta 3, toggling Wi-Fi and Bluetooth in Control Center changes their icons from blue (active) to white (inactive). To completely turn off either Bluetooth or Wi-Fi, users must delve into the Settings app in iOS, or enable Airplane Mode in Control Center or via Settings.